Customisation and personalisation are something we take very seriously at The Proper Booth! 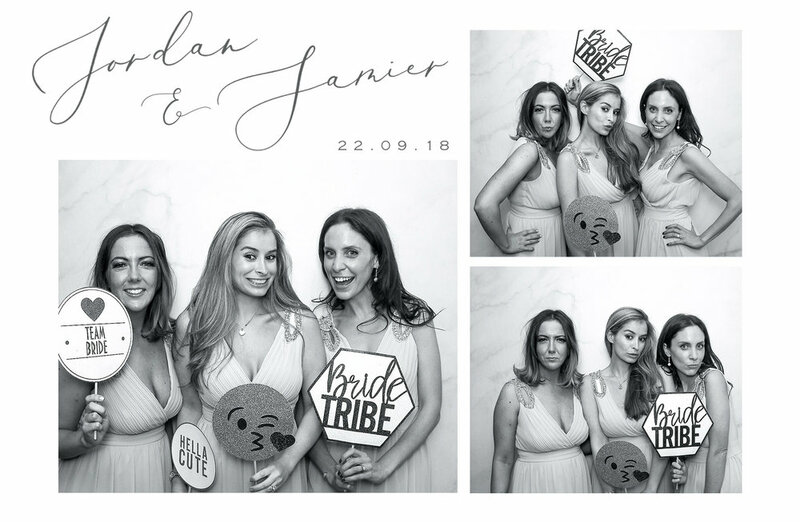 We love being able to offer a fully bespoke service, where your photobooth print out designs match seamlessly with your wedding or event stationery. It adds to the overall feel of the day or event, and shows that everything has been thought through will great care and is not a last minute after thought. We work closely with each of our clients to achieve the right look and feel. It means that every print out design we create is never repeated. You will truly get a unique design just for you. We know that Brides and Grooms spend hours looking for the right wedding stationery. From the invites to the table place names. We know you have taken so much time to ensure all these elements work together to reflect the style of your day perfectly. So why opt for a generic photobooth print out that could be found at any wedding or event? Especially when a bespoke design comes as standard with any of our photobooth packages. Just take a look at some of the designs we have created for Weddings in 2018. All designed to match their beautiful wedding stationery. This was an elegant design perfect for our square print option. Another one of our favourite wedding invites. We matched the design on our photobooth strips and even added a watercolour paper texture to add that extra touch of customisation. When wedding stationery looks this good you have to incorporate it anywhere you can! We love a total black & white booth. Their wedding stationery was a beautiful monochrome design, which matched perfectly to their photobooth print outs. It’s not just weddings that benefit from our bespoke print out designs. Corporate events are also excellent opportunities to create something unique that matches all elements of the event. Whether it’s including logos, hashtags, sponsors or marketing materials, a photobooth print has the power to reflect a brand and the events feel and provides additional advertising and marketing to anyone that takes away a photobooth print. Here’s some of the print outs designed for corporate events in 2018. Ready to book your photobooth with us? Contact us today.